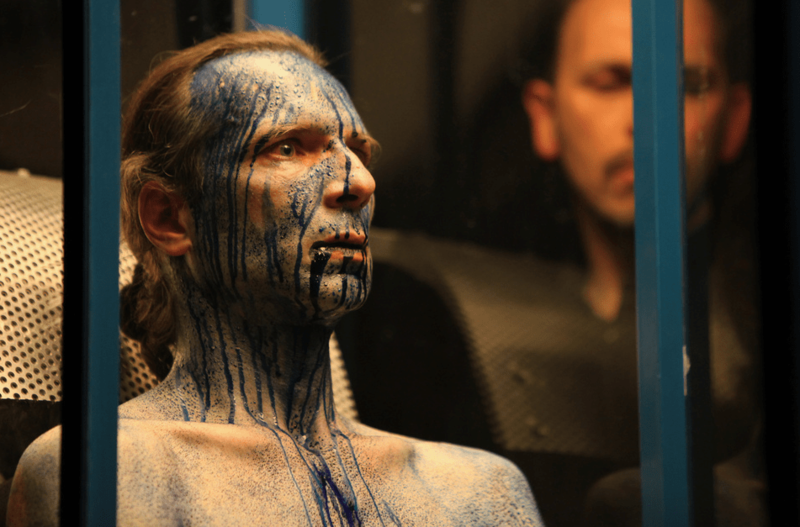 In his spectacle-instalation Bleu remix, Yann Marussich returns to the theme already explored in 2001, in the Bleu Provisoire spectacle when he let a mysterious blue liquid ooze as blood would, through the layers of his skin, as though it was a final effect or a by-product of his body’s inner processes. This way, Marussich opened the paths between the inside and the outside world – secret passages from the unconscious, straight to the conscious. Each time the spectacle is performed, a different (local) musician accompanies Yann This exceptional – unique and one-time – confrontation of a musician with a performance establishes a new relation between the sound and the created image. The spontaneous meeting of two artists brings an element of risk and uniqueness to the event, as if the music explored the spectacle over and over again and depicted new ways of perception. Born in 1966, Yann Marussich is an isolated character. In contemporary dance and performance: “hypersensitive, puzzling, provocative, authentic” he delivers performances from which we don’t come out of unharmed. Since 1989, he has signed about thirty performances and choreographies broadcasted all over Europe. From 1993 to 2000, he evolves in the domain of artistic programming as the director of the Théâtre de l’Usine (Geneva) where he programs almost exclusively contemporary dance and more specifically new forms of expression. He is also the founder of the ADC Studio (Geneva) created in 1993. In 2001, Yann Marussich signs Bleu Provisoire, his first totally motionless piece. Since then, he is sinking into introspection and the control of stillness meanwhile confronting his body to diverse solicitations, or even aggressions: that is where the poetic space of the performer is located, in an often violent contrast between what his body is undergoing and an absolute impassivity. His last pieces are solos, which he considers as a full-fledged style. Glassed (2011), Bain Brisé (Broken Bathtub) (2010), Ex-Pression (2009), Bleu Remix (Blue Remix) (2007), Nuit de Verre (Glass Night) (2007), Soif (Thirsty) (2006), Blessure (Wound) (2005), Traversée (Crossing) (2004), Autoportrait dans une fourmilière (Self Portrait in an Anthill) (2003), Morsures (Bites) (2004), have been presented in many festivals in Switzerland and abroad. Yann Marussich is registered by the Department of culture and contemporary art funds of the city of Geneva. In 2008 he receives the Ars Electronica award in the category Hybrid art. In 2008, he received the Ars Electronica price in the category Hybrid Art.